By Stephen M. Leaden, President, Leaden Associates, Inc.
As industry consultants and analysts, we are beginning to see a dramatic shift towards videoconferencing and its use. Most of our enterprise clients are beginning to show significant interest and even demand for it. 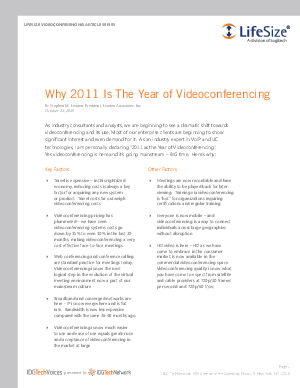 As an industry expert in VoIP and UC technologies, I am personally declaring “2011 as the Year of Videoconferencing”. Yes videoconferencing is here and it’s going mainstream – BIG time. Read this white paper to find out why.